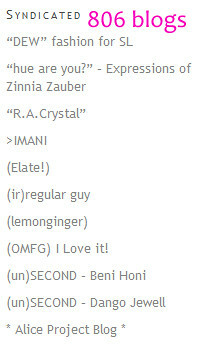 iheartsl.com syndicates a lot of sl blogs, 806 to be exact! I’ve noticed that when the site is syndicating this many blogs, it will experience occasional server hiccups (blogs not updating, database errors, etc. ), so I’ve recently added a policy to remove blogs that have not updated for 60 days or more. This has reduced the number of inactive blogs quite a bit — but it’s totally screwing up my “syndicated blogs” count. When I checked in the site dashboard, the total is 1,161, which is NOT an accurate number. I think that number reflects the numbers of blogs (links) that has *ever* been syndicated. A more accurate number is 806 — which is reflected on the blogroll. I copy & pasted my entire blogroll links into Excel to count ’em. With that said, I think that iheartsl.com is the “largest” community blog feed, simply because it’s syndicating the most. Fashionplanet, which has been around forever, is only syndicating 583 blogs (I counted!) but a lot of people still read it out of habit. Iheartsl.com has just passed the 2 year mark (in January) and it’s still going strong. I’ve had a lot of issues with it, but I’m really happy that I have my server problems under control now (for the most part). Thank you for ALL of your patience for the past 2 years, and for being so supportive.